Finding a snake in Alabama can be a scary thing. Here's some tips for when you accidentally discover a snake when walking in the woods or hiking in the mountains around Huntsville. I'm not sure about you, but I'm very afraid of accidentally discovering a snake when walking in the woods or hiking in the mountains around Huntsville. The copperhead has a bright copper-colored head. The cottonmouth or water moccasin swim with the head and neck high above the water. Other snakes don't do this. The coral snake has red and black rings always divided by narrow yellow rings. The phrase to remember this is: "Red on yellow will kill a fellow, red on black venom lack." Finally, the rattlesnake lifts its tail and makes a rattling sound with the horny shells on the end of the tail. When entering any area, use caution. Use a stick or some type of rod to move objects slowly and carefully to check for anything hidden behind them. If possible, wear boots and heavy gloves when clearing an area and work with someone else. Make noise when entering an area to alert snakes to your presence and to cause them to make a sound or movement that will tell you their location. Snakes will not usually bite unless cornered, handled or stepped on, and most snakes are not poisonous. If you find a snake, it is best to leave it alone. Snakes will return to their own environment away from humans as quickly as they can. Snakes help keep the rodent population down, so it is best not to kill them unless absolutely necessary. If you must kill a snake, one of the most effective methods is to use a long-handled hoe to strike it in the back of the snake's head. Be sure to warn children to watch out for snakes and not to get close to them. Tell them it is best to back off quickly and quietly from a snake to avoid making it feel threatened. Try to stay as calm as possible. The victim should be made to lie still and keep the bitten area still. The victim should try to remember what the snake looks like, but should not try to kill it. This is because the snake bite victim should stay as still as possible to slow the movement of the poison from the bite to other parts of the body. If someone else can kill the snake, it should be saved for identification by medical personnel. If possible, victims should be carried to medical help or have help brought to them. A bite victim should walk only if necessary and then very slowly. 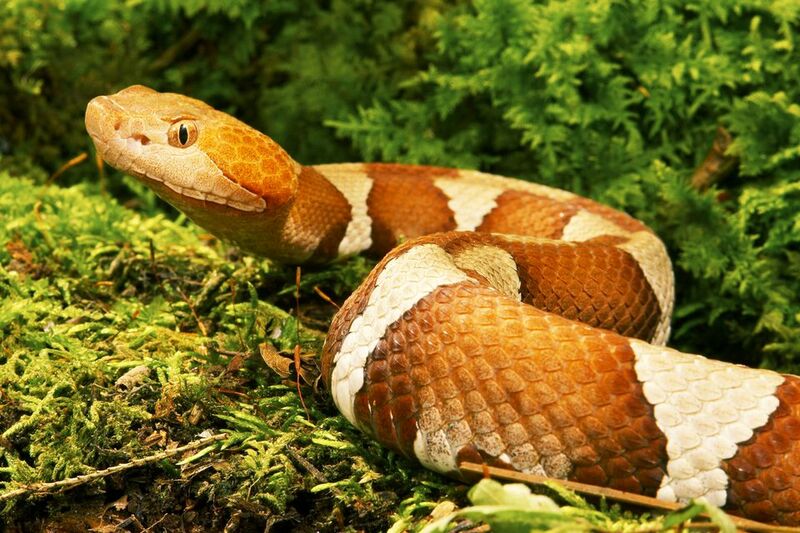 Symptoms of poisonous snake bites vary, but for rattlesnakes, cottonmouths, and copperheads, symptoms include severe pain, rapid swelling at the wound site, weakness, nausea and vomiting, blurred vision, breathing difficulty, convulsions, and shock. The symptoms of a coral snake bite differ in that there is slight pain and swelling at the bite site and the victim may experience difficulty in speaking, drooping eyelids, heavy sweating and drooling, drowsiness and paralysis in addition to nausea, blurred vision, and vomiting. The absence of distinct fang punctures and failure of local pain, swelling, numbness or weakness to appear within 20 minutes are strong evidence against snake venom poisoning. If the victim is not breathing, try to restore breathing. Unless used properly, tourniquet or snake bite kits may do more harm than good. If you tie anything above the bite area to prevent the spread of the poison, you should be able to slip your finger under what you have used as a tourniquet. If the area under the tourniquet swells, move the tourniquet two to four inches above where you first placed it. If it is a coral snake bite, DO NOT use a tourniquet. If you use a snake bite kit, follow the instructions. Do not cut any deeper than the skin or you may damage muscles, nerves or tendons. A rubber bulb, breast pump or heated jar are all preferable to mouth suction, but if other means are not available and the person sucking out the venom has no open mouth sores, mouth suction may be used. Do not swallow the venom--spit it out. Never use cold or ice compresses on the victim. The cold may damage the tissue. Do not give the victim food or alcoholic beverages. The victim may have small sips of water if he or she is conscious and is able to drink without choking or vomiting. So, be careful when you go outdoors in Alabama, but enjoy nature and don't let snakes keep you stuck inside when the weather is beautiful and you want to enjoy living in the South.